So beautiful. And what could be better than eggs and chocolate -- the perfect start or finish to any recipe. A lovely grouping -- particularly like the egg with the lacy leaf. Great contrast. Why thanks. I DID enjoy those egg pictures. Who would have thought you could get so creative with an egg. Well, we're talking YOU, so "Very Creative" is what we got!! I really enjoyed your photos, the first one is my favourite. Your backs and whites are perfect. I found that hard to achieve. How fun that you are taking a still life class too. Very interesting light play with the b&W shots,gorgeous indoor and out in nature imagery. I do like! Egg in a pocket! And the cooking sequence makes me hungry. And the leaves...I love it all. i keep saying wow at everyone's egg photos! the top one is beautiful...and my faves are the still life ones....i also prefer the lower one with the shadows. shadows are always interesting to me!! good thinking on hard boiling. i had a close call too, but i caught it! Your photos keep getting better and better. I really enjoy them. Thanks. Bravo, Gail! Love them all, especially the two with the shadows. love the outdoor eggs. and the broken one I can almost taste. Beautiful tonality and color choices. Every one is exquisite. Kudos! Just love your accidented egg! What a great work you've done, they are all so inspiry! I like your egg accident as well. I also agree, the shadows with the stilllife makes the whole composition a little more interesting. Really beautiful pictures! Love the outdoors ones! Your photos are always fun to see. The egg in the sea shell photo took my breath away. beautiful. 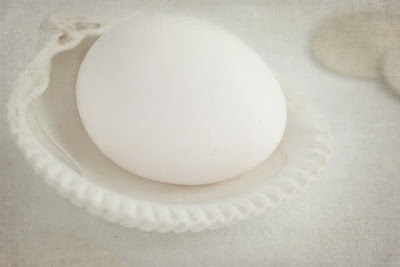 And I absolutely love the photo of your broken egg. The yellow is so vivid. I´d love to know what background you used and your light source. 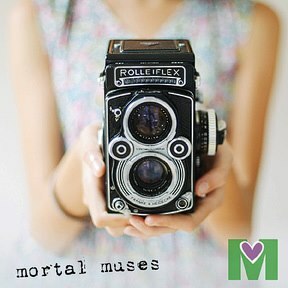 Your photos are beautiful and your exposure looks great! i agree the light from the sun worked beautifully for those last photos. i really like the detail of the lacy leaf against the egg. the black and whites are beautiful. great exposure! Your cracked egg photo is wonderful! It fed my current need for all things yellow. Must have something to do with daffodil time. Love your amazing and very inspiring photos. The white looks so pure and fragile and the light and shadows are wonderful. I truly enjoyed your images! They are so wonderfully created and well thought out! The last grid is my favorite! Can't wait for next week! Love the broken egg, the yellow and salt are beautiful. Of course now I am hungry. What a wonderful bunch of images. Your setting sun pictures are spectacular. It's interesting to see eggs in the kitchen, too... and especially the broken one! Great shadows on your black and whites! And, yes, I like the shadowed panel on your trio the best, too. The simple brown against your white egg in the outdoor series is gorgeous. The egg in a sea shell is wonderful and I really like the last gird - the colors are wonderful. All are beautiful. Great! i love these posts about your class assignments! i hope that's not a dumb ignorant question! Aren't those all so lovely!! I love the last few. I love all of your photos. Awesome lighting and compositions. That cracked open hard boiled egg is very cool and the nature egg collage is great. How delicate the see thru leaf look over the delicate shell of the egg. 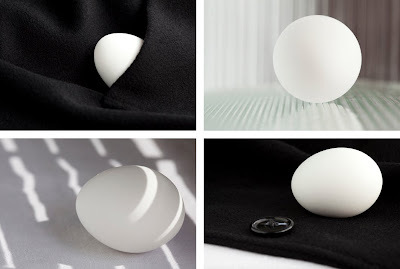 Your B&Ws are stunning - love the shadow play on the white background, and the button in the bottom-right photo! 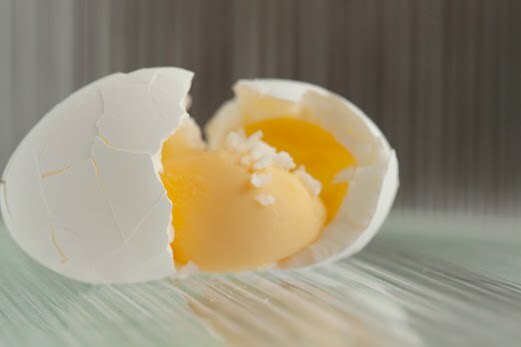 The broken egg with the delicate, silky looking soft yellow peeling out against the harder yellow is so beautiful! Happy accidents! And egg in nature - very moving (somehow)! Love the outside shots against the brown. Nice use of light. and nice to meet you! Stunning...I really did enjoy your photos. The egg peek out the pocket is fantastic. 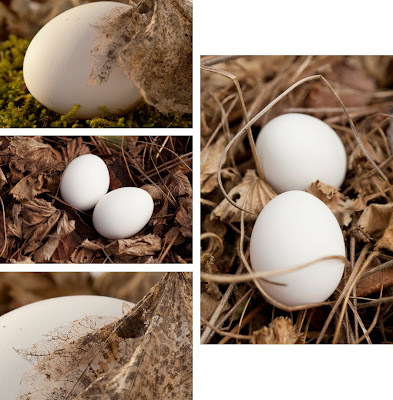 The nature and egg photos are really stunning. PS: forgot to say that I like the boiled egg photo also. I think you did a creative job here.great first assignment~! these are amazing! such beauty here. That last outdoor set is my favorite. Great photos, and what a fun assignment! Beautiful Gail! I like how you used different spaces in you white point shots. The top image is enchanting and the broken egg makes me hungry. The cookbook shots and grid are fun. The red lettering is a nice touch. I think I prefer the top shot-- the shadows are fun, but a little confusing, as far as images go, since there are several strong elements in the image. The leafy grid is very pretty-- nice touches! The photos are fantastic!! WOW!! I love the eggs in the cooking shots and with Chocolate! How fun.